For many years, my father had a hush-hush arrangement with a stand holder at Lancaster Central Market. I only learned about it last year when he delivered a coveted box of the first homegrown strawberries after I had come home empty handed only hours before. After shopping at market for sixty-plus years, my father seemingly earned the favor of the first few boxes of berries from one special stand. These gems are hidden bellow until he arrives and the clandestine swap is made. To protect the parties involved—and in hopes that I remain a recipient of these early delicacies—I offer no names. There is nothing like those first few homegrown berries, with their glossy exterior and natural sweetness. In our house, the first few cartons are typically consumed straight up. But when our supply is plentiful enough to cook with them, this is one of several recipes we enjoy over and over. 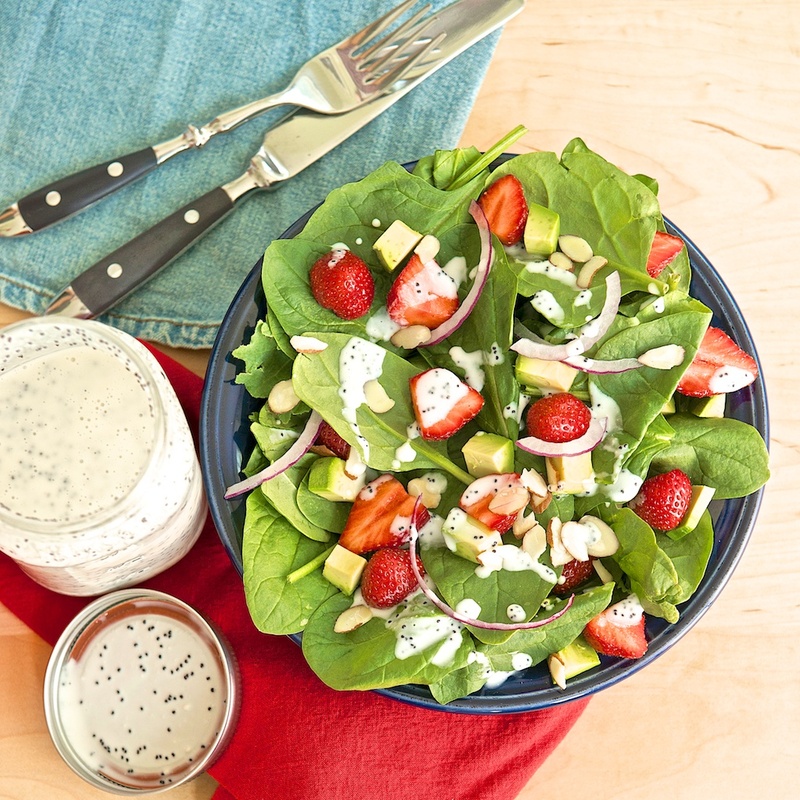 When strawberry season is over, try this dressing in a salad using other berries, peaches, mango, kiwi, or a combination of your favorites. Avocado, snap peas, leftover cooked asparagus, and goat cheese are all tasty additions to this salad. For further variety, swap the almonds for pistachios, pine nuts, pecans, or a combination of several nuts. Top with grilled chicken for a complete meal. Yields 6-8 serving; 4 servings when topped with chicken and served as a main dish. Mix all of the dressing ingredients well. Drizzle just enough of the dressing over the salad to lightly coat when tossed. Store the remaining dressing in a jar in the refrigerator; shake well before using. The dressing will keep for about a week. 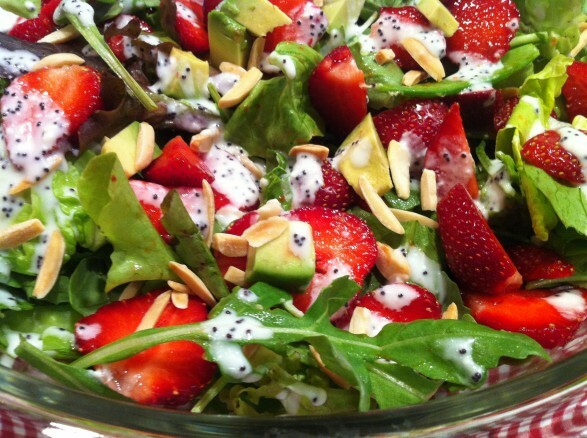 Beautiful salad and the dressing looks divine. Will try it soon. Love your site! Thank you very much for the comment, Denise! I hope you love this salad as much as I do! Thank you, Beverley. This dressing is high on my list of favorites. If you enjoy, I highly recommend it with my “Summer Salad”, adding Lime Honey Chicken for a complete meal. It tastes as delightful with peaches as it does strawberries! I despise mayo! Can you taste it in this dressing? Or can there be a substitute? I have committed to never buying a pre-made dressing and I’m searching for an arsenal of recipes! I don’t think the mayo taste is very apparent in this recipe…but I do like mayonnaise and may not be as sensitive as you. To be safe, I have two suggestions. The first would be to go a little heavier on the yogurt. The dressing may be a little tangier, but if you use 2% or whole milk yogurt the taste would be smoother. 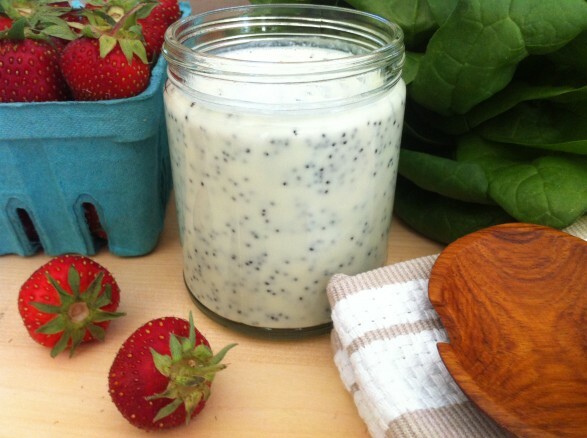 Also, here is a link to another poppy seed dressing I have been making for years. https://fountainavenuekitchen.com/spring-millet-salad/ It’s not creamy but is interchangeable with this version. Just scroll down the page as the recipe is the second one listed. Hope you enjoy! This dressing looks great. I’m going to try it. Thanks, Margo…and I hope you enjoy!